Topic: Can I use C++ code in my game? Re: Can I use C++ code in my game? Topic: Drawing a tilemap on a canvas, problem with culling. Re: Drawing a tilemap on a canvas, problem with culling. Thank you guys for all the comments and support! Just thought I'd leave this here, you guys might find it useful. Do let me know if this was useful, or if you still have questions that we could maybe tackle in another post. 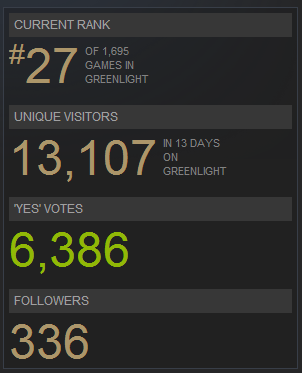 Just thought I'd keep you guys updated, with the recent batch of greenlit games, we've not only gotten through to the top 100, but we've been bumped up and are as of now ranked #27 of all the games on Greenlight!